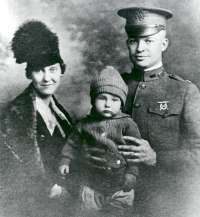 Captain Dwight D. Eisenhower and his wife Mamie with their son, Doud Dwight (nicknamed Icky), who was born on September 24, 1917. As the U.S. Army's Coast-to-Coast Motor Transport Train began its journey to San Francisco, Lt. Colonel Eisenhower was thinking about leaving the U.S. Army. A soldier without battle experience in a shrinking army-what future would he have? Moreover, he had been living in the Bachelor Officers Quarters at Camp Meade in Maryland. Mamie and their new son, Doud Dwight (nicknamed Icky) who had been born on September 24, 1917, were staying in Denver until he received orders for his next station. He called Mamie several times a week [while on the convoy], beginning each call with requests for news about Icky. How was he growing? What new mischief had he gotten into? Once Mamie interrupted with, "Listen here . . . how about asking how your wife is?" Ike was chastened; he chatted for a moment about Mamie, but soon turned the conversation to Icky again. Mamie gave up. While living at Fort Meade, Mamie and Dwight Eisenhower experienced the most shattering moment of their lives, one that almost destroyed their marriage. Shortly before Christmas 1920, Icky became ill with scarlet fever he apparently contracted from contact with a 16-year old local girl hired as a maid. Although a specialist from Johns Hopkins Hospital in Baltimore was rushed to the base, nothing could be done. Icky died on January 2, 1921. These feelings had to be suppressed if the marriage was to survive the disaster, but suppression did not eliminate the unwanted thoughts, only made them harder to live with. Both the inner-directed guilt and the projected feelings of blame placed a strain on their marriage. So did the equally inevitable sense of loss, the grief that could not be comforted, the feeling that all the joy had gone out of life. "For a long time, it was as if a shining light had gone out in Ike's life," Mamie said later. "Throughout all the years that followed, the memory of those bleak days was a deep inner pain that never seemed to diminish much." Forty-five years later Eisenhower, by then a national hero, flew to Abilene in an unpublicized trip. Dressed in a charcoal-gray suit, his deeply lined face pale and taut, Ike stood bareheaded as the body of little Icky, taken from Fairmont Cemetery, was reburied beneath the marble floor of the little thin-spired chapel of buff-colored stone on the grounds of the Eisenhower Center. Eisenhower and Mamie would be buried next to their first son. In 1967, Eisenhower would look back on Icky's death as "the greatest disappointment and disaster of my life, the one I have never been able to forget completely." For the rest of his life, he sent flowers to Mamie on Icky's birthday.